In the last 50 years, art criticism has flourished as never before. Moving from niche to mainstream, it is now widely taught at universities, practiced in newspapers, magazines and online, and has become the subject of debate by readers, writers and artists worldwide. Equal parts oral history and analysis of craft, What it Means to Write About Art offers an unprecedented overview of American art writing. 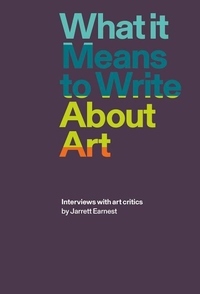 Jarrett Earnest's wide-ranging conversations with critics, historians, journalists, novelists, poets and theorists--each of whom approaches the subject from a unique position--illustrate different ways of writing, thinking and looking at art. These in-depth conversations about writing and art are situated within individual life experiences: for instance John Ashbery recalls finding Rimbaud's poetry through his first crush at 16; Rosalind Krauss remembers stealing the design of October from Massimo Vignelli; Paul Chaat Smith details his early days with Jimmie Durham in the American Indian Movement; Dave Hickey talks about writing country songs with Waylon Jennings; Michele Wallace relives her late-night and early-morning interviews with James Baldwin; Lucy Lippard describes confronting Clement Greenberg at a lecture; Eileen Myles asserts her belief that her negative review incited the Women's Action Coalition; and Fred Moten recounts falling in love with Renoir while at Harvard. Other interviewees include Hilton Als, Bill Berkson, Yve-Alain Bois, Huey Copeland, Holland Cotter, Douglas Crimp, Darby English, Hal Foster, Michael Fried, Thyrza Nichols Goodeve, Siri Hustvedt, Kellie Jones, Chris Kraus, Molly Nesbit, Jed Perl, Barbara Rose, Jerry Saltz, Peter Schjeldahl, Barry Schwabsky, Roberta Smith, Lynne Tillman and John Yau. Jarrett Earnest is a writer and artist living in New York City. From 2014 to 2017 he was faculty at the free experimental art school Bruce High Quality Foundation University (BHQFU), running their MFU programs in New York and Miami. He coedited the volumes Tell Me Something Good: Artist Interviews from The Brooklyn Rail (2017) and For Bill, Anything: Images and Text for Bill Berkson (2015). His writing has appeared in the Brooklyn Rail, the Village Voice, Los Angeles Review of Books, Art in America and San Francisco Arts Quarterly, among others.